Joseph Calabria was admitted to the New Jersey and Federal District Court bars in 1988. One year later he was admitted to the Pennsylvania bar. Joe received his undergraduate degree from Montclair State University (B.A. 1979) and his law degree from Seton Hall Law School (J.D. 1988). He began his legal career as a judicial law clerk for the Hon. Rosemary Higgins Cass in Essex County. After completing the trial and educational requirements, Joe was certified by the Supreme Court of New Jersey as a Civil Trial Attorney in 1997. 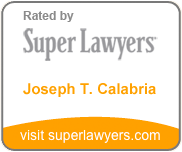 Recently, Joe was selected for inclusion in 2011 publication of New Jersey “Super Lawyers” in the area of general litigation. Currently, Joe has more than 20 years experience as a litigation attorney. Joe’s involvement in the law extends beyond the courtroom. He presently serves as a court appointed arbitrator for personal injury and contract cases. He is a member of the New Jersey State Bar Association, as well as the Bergen and Hudson County Bar Associations. Joe is a former federal court arbitrator and adjunct professor at Montclair State University and Berkeley College.